Months of inventory (MOI)* remained in double digits for detached homes for a third consecutive month in February. February's MOI was the highest February and also the only time a February has been higher than January of the same year since 2006 . 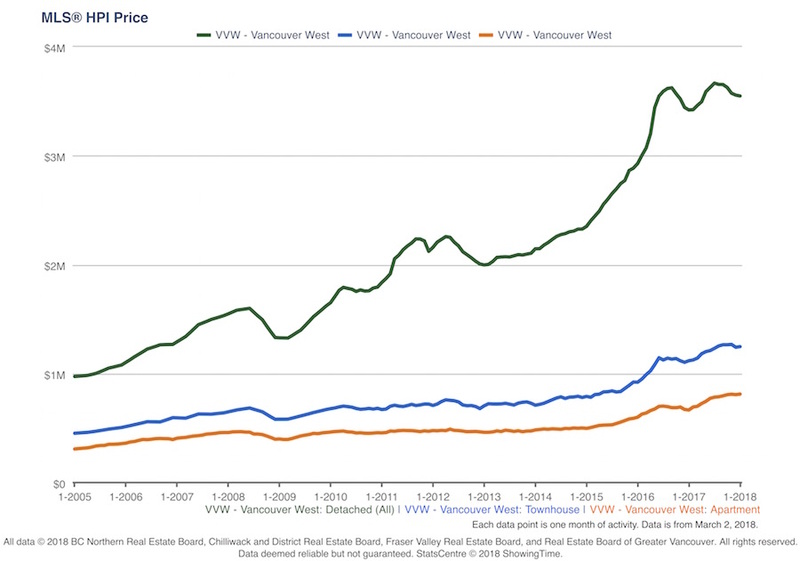 Westside Detached house prices seem likely to see downward price pressure in the coming months. In sharp contrast, Apartments remain deep in a seller's market with an MOI of only 1.97. Attached homes also remain in a seller's market at 3.61 months of inventory. Active listing volumes remain super low by the last decades standard's for both Apartments and Attached homes and this is the significant reason for their low MOIs. Detached homes are at pretty fairly typical levels for the same time period. Notice that there are actually more houses for sale than there are apartments! 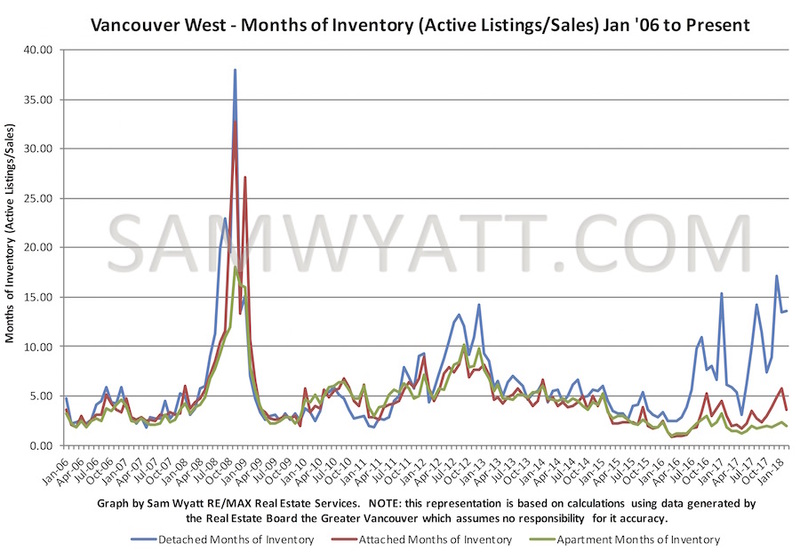 While inventories remain in typical range for detached homes, their sales volumes are simultaneously near 10 year lows. Only 52 Westside houses were sold in February 2018; compare that to the 226 homes sold in February 2016. 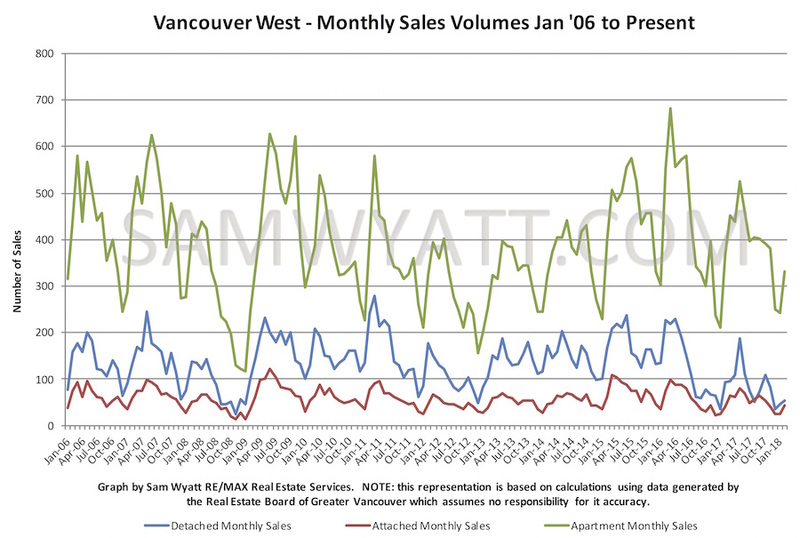 Low sales volumes for detached homes are driving the high MOI. 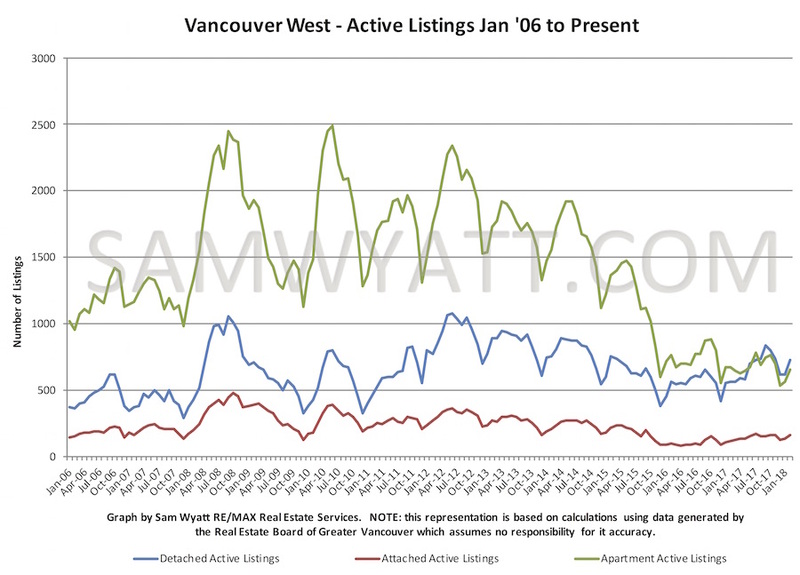 Apartments and Attached homes have sales volumes hovering near the median volumes of the last decade. 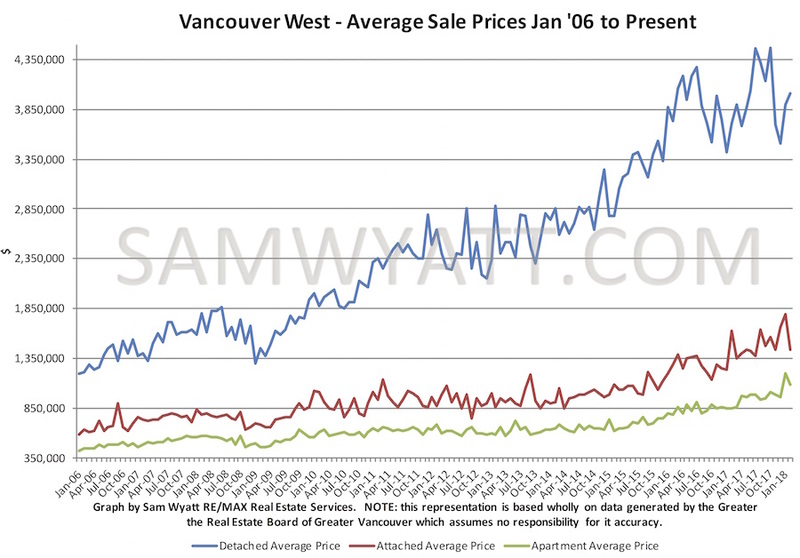 The average sale price of a detached Westside Vancouver home was over $4m in February. The Real Estate Board of Greater Vancouver's HPI pegs the price of a "typical" Westside house at about $3.5m. The median price per square foot of apartments continues to rise while attached and detached pricing per square foot are stalled and stagnating respectively. 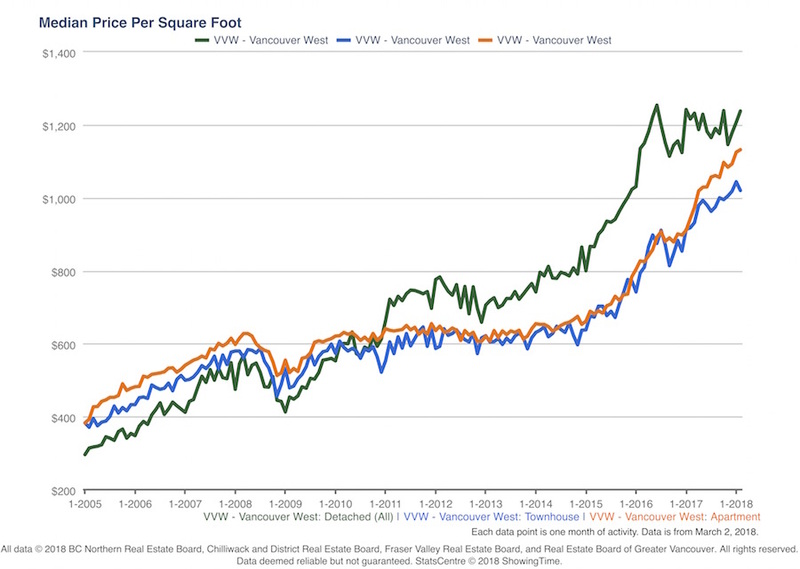 If the current trend continues, apartments' price per square foot might exceed that of houses within 6 month's time. What is driving both the slowing house market and hot apartment market is likely the tougher mortgage rules that where introduced in 2016 & 2017. The new rules have made borrowing more difficult and have probably had the unintended effect of forcing less costly apartment prices up because it is easier to obtain the financing to buy them. With the recently announced suite of new Provincial tax measures aimed at the housing market, the already cooling house market is poised to flag while it remains to be seen if apartments will be similarly affected over the coming year. *Months of Inventory (MOI) is a measure derived from the number of active listings during a given month divided by the number of sales that month. It indicates the theoretical length of time it would take to sell all of the properties on the market if nothing changed. Historically, 0-5 months of inventory has generally implied upward price pressure ("Seller's Market"), 5-8 months of inventory has indicated a flat market ("Balanced Market") with respect to pricing and over 8 months of inventory has, for the most part, precipitated downward price pressure ("Buyer's Market").